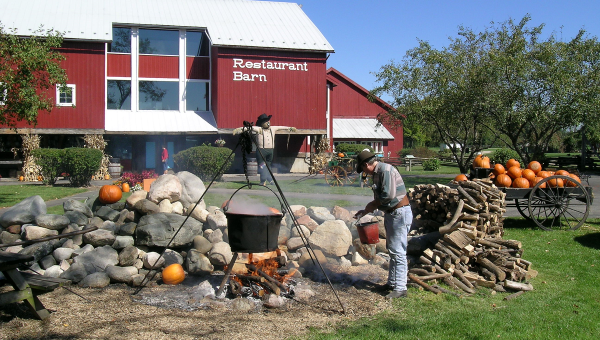 Visitors will come from near and far to experience Fall Harvest Days at Amish Acres mid-September through November 1st. Fall is one of the most beautiful seasons in Indiana with its cool, comfortable days and crisp October evenings. Amish Acres Historic Farm and Heritage Resort will be decorated for the season with corn shocks, pumpkins and scarecrows galore! Visitors will enjoy the Harvest Market featuring crisp fall apples and of course pumpkins, along with gourds, squash, bittersweet, and Indian corn. 12 p.m.; 1 p.m.; 3 p.m. 12:15 p.m.; 1:15 p.m.; 3:15 p.m.
A leisurely farm wagon ride travels down the gravel lanes, through the woods and out to the pumpkin patch where friendly scarecrows stand guard over rows and rows of bright orange pumpkins. Kids can choose a pumpkin to take home and enjoy roasting marshmallows* over an open camp fire. *Marshmallows are back at the pumpkin patch 11 a.m.-5 p.m. Saturday and Sunday.